The AGITG offers a number of awards and grants every year for research concepts that have the potential to make an impact in the area of gastro-intestinal cancer research. 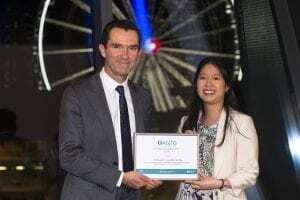 Dr Christina Teng accepts the 2018 AGITG Innovation Fund from Prof Tim Price on behalf of Prof Janette Vardy. A grant of up to $200,000 for a proposed AGITG-sponsored new research study that aims to lead on to a larger scale AGITG-sponsored trial to be supported by a peer-reviewed grant source or industry. Applications close Friday 10 May. The award will provide one year’s funding at an equivalent level to NHMRC support for a higher degree ($36,700) for a clinician undertaking an MD or PhD researching an aspect of personalised medicine in the area of gastro-intestinal cancer. Applications close Friday 7 June. The John Zalcberg OAM Award for Excellence in AGITG Research recognises a member of the Australasian Gastro-Intestinal Trials Group (AGITG) who has made a significant and outstanding leadership contribution to AGITG research over a sustained period. Nominations may recognise the contributions of investigators, research staff and lay members of the AGITG including consumers. Applications close Thursday 4 July. The presentation that is voted Best New Concept at the New Concepts Symposium will win $3,500 and the concept will be taken forward for a formal review by the AGITG Upper or Lower GI Working Party. Applications close Tuesday 21 May. The best abstracts from the Poster Session and Fast Forward Session at the Annual Scientific Meeting will receive $3,500 and $1,500 respectively. Applications close Tuesday 30 April. Clinical trial sites actively involved in AGITG trials are encourage to apply to win two complimentary registrations to the 2020 Annual Scientific Meeting. Applications close Monday 8 July.